Learn how to install contemporary ceiling fans in the home. An easy DIY project, ceiling fans will lower heating and cooling bills. Manufacturers include Hunter, and Hampton Bay. Contemporary ceiling fans help homeowners conserve energy and save on heating and cooling bills by moving air efficiently in the home. Ceiling fans also add appeal and style by dressing up the living room or bedroom. And this is a DIY project that any homeowner can take on. 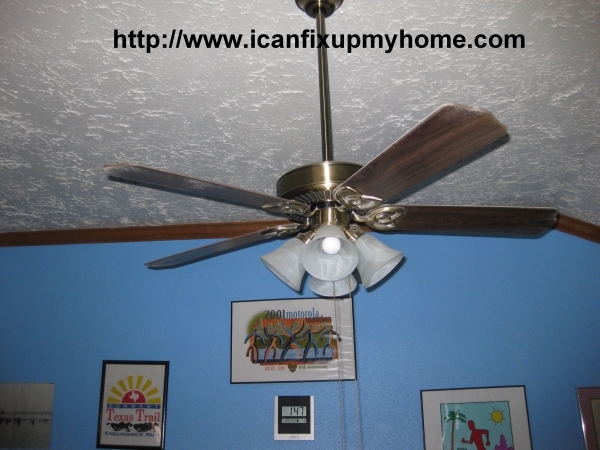 This article will show the weekend handyman how to install a ceiling fan. Choosing a ceiling fan is the hardest part of the process. Things to consider are size, style, how much money to spend, and whether theres really a need for another remote control to hide itself in the couch cushions! Choose a fan that is reversible. It should blow down in the summer and up in the winter. Stepladder and a helper to steady it. Go ahead, throw the kid a couple of bucks and teach a bit of DIY. Ceiling fans are heavy and they tend to vibrate so its important to use a fan-rated metal electrical box. Cut out the drywall and insert the box into the opening. Secure it to the wood joists on either side using a box brace. This is easiest done from the attic. Wire the box after being certain that the appropriate circuit breaker is turned off Just like when replacing an electrical light switchreplacing an electrical light switch. Of course this step isnt necessary if an old fan is being replaced. There are two distinct ways to hang a ceiling fan. If the room has a high vaulted ceiling, the down rod fan mount is appropriate, especially if the fan is to be mounted on a sloping ceiling. Down rods are available in various lengths with a finish that matches the fan. This is a good argument for buying a well known brand of fan such as a Hunter, Hampton Bay, Casablanca, Emerson, or Harbor Breeze ceiling fan. For a standard eight foot ceiling, a flush mount is the way to go. This will usually involve using the (supplied) very short down rod with the ball. Most contemporary ceiling fans use the ball and socket approach. Connect the down rod to the fan. The electrical wire leads from the fan should be fed through the rod. Slide the canopy and any trim down the down rod and hang the ball in the socket. This will make it easy to connect the wires. Connect the house wires to the fan wires and use wire nuts to secure the connection. These will be supplied by any quality name brand ceiling fan, such as one of those listed above. The instruction manual will specify wire details for that particular model. Secure the canopy and trim at ceiling level, being careful not to pinch any wires. Now attach the fan blades. Generally, these snap into place. Install the lights if so equipped. Carefully examine the bottom of the fan. Sometimes the ceiling fan manufacturer puts rubber wedges in the bottom outside edge to keep it from spinning during installation. The installation manual usually omits this little fact. Ready to get started? Do it yourself or find thousands of unbiased ratings on the best – and worst – electricians and service companies in your area. Try Angies List.